The Donkey Sanctuary Aruba was founded in 1997 as a non-profit organization with a clear purpose to save the donkeys that populated the island of Aruba. The Donkey Sanctuary Aruba used to be located on Santa Lucia in Santa Cruz, just a few kilometers northwest of Arikok National Park. Just north of the old sanctuary, you will find Andicuri Beach. The Ayo Rock Formations are also located nearby. Just recently the Donkey Sanctuary Aruba has moved to a new location in the neighborhood of Bringamosa. Bringamosa is an elevated settlement and lies roughly 70 meters above sea level. The new Donkey Sanctuary is eight times larger than the former location and can easily be reached by car or taxi. The Donkey Sanctuary Aruba is open from Monday till Friday from 9 AM to 4 PM. On Saturdays and Sundays, the sanctuary is open from 10 AM to 3 PM. At the Donkey Sanctuary Aruba, there is no admission fee. No ticket is needed. However, donations are very much welcome! The donkeys love apples and carrots, feel free to bring some when you are planning to visit. The Donkey Sanctuary Aruba is a great place to visit with your children. During the colonial era, the donkey was brought to the island by the Spanish to fulfill all kinds of purposes. However, the donkey became a beast of burden because the animal was mainly used for transportation of humans but also for all kinds of rather heavy stuff. When their usefulness ended after the introduction of other types of transportation, they were released of their duties and forced to provide for themselves. Many donkeys were set free to go live in the wild. The population of the donkey increased over time and eventually the donkeys became a nuisance because there were just too many occupying the island. It is said that their population grew well to over a thousand. People decided to shoot them, feed them to other animals with the sole purpose to decrease the population. The donkey also became a real problem for traffic, especially during the night. Many donkeys got hit by cars, buses, and trucks when they were walking or just standing on dark roads. 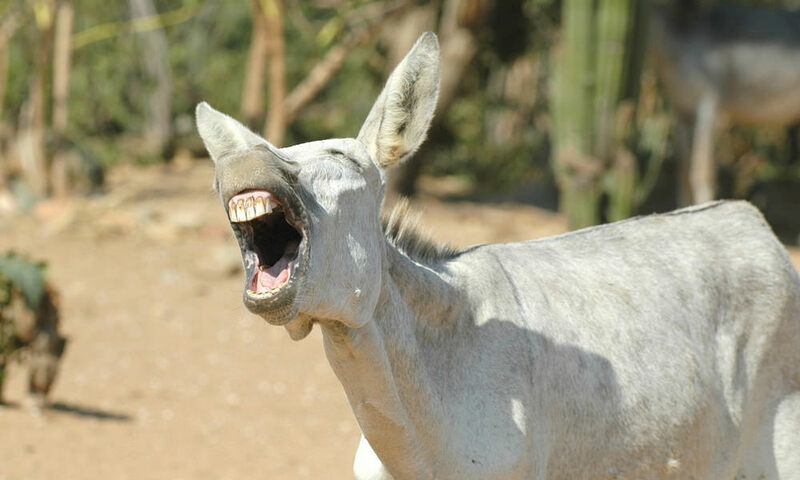 As a result, the donkey population decreased. Some 40 years ago the population got hit by a rapidly spreading disease and the donkey almost vanished from the island. Only a small group survived. At that time, a movement of volunteers stood up and began to save and take care of the Aruban donkeys. This movement realized very well that the donkey had to survive on Aruba since the animal already had been on the island for almost 500 years! Today, the humble non-profit Donkey Sanctuary Aruba provides food, shelter, and medical care to almost two hundred animals. They even get a name when they arrive. Visitors can feed and pet the donkeys, and locals are encouraged to adopt them. At the Donkey Sanctuary Aruba refreshments and snacks are available. There is also a gift shop where you can buy all kinds of souvenirs. The newly built visitors center offers shade and restrooms and there is sufficient room for parking.